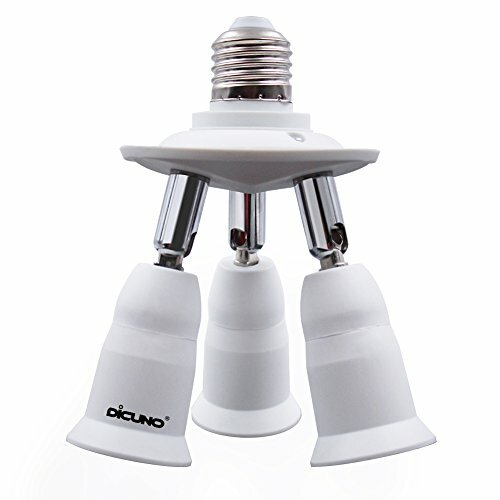 DiCUNO 3 in 1 E26/E27 socket adapter safe and easy to install, enlarge the chandelier socket to suitable for studio daylight bulbs. This product allow 3 bulbs installed in one single socket and each socket can be adjusted the direction perfect work for photo or video. It made of high-quality PBT have a good shock resistant, anti-burning and anti-aging. Adapter Type: 3 in1 E26/E27 adapter. Dimensions: 3.3 x 3.6inch (L x Dia). Package: 1 x E26/E27 base socket adapter.